Seabuckthorn berry CO2 total from Lithuania. Species: Hippophae rhamnoides. Class: Fatty Acid Triglyceride. CAS: 90106-68-6. 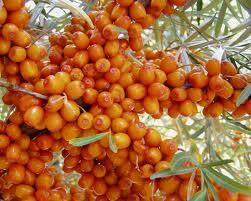 Aromatherapy uses: For skin health, because seabuckthorn oil is loaded with fatty acids, such as palmitic acic, palmitoleic acid and oleic acid, and other compounds that are considered to be anti-aging.